What do you guy think of this rig? 1999 Dodge Ram 1500 4 inches of lift..315/75/16 multi mile mud claws..Custom rear bumper..bull bar..fender flare. Soon to swap a 93 12 valve cummins into it. Seems like a fair price to me. I'd go for it since it already has the NV4500 done...but that can also be a can of worms if the "installer" was a hack. I'm pretty picky on how I like my stuff installed. Yeah the price seems pretty solid for what you are getting, but just make sure you're sure that the previous owner did a good job installing that trans. No booger welds or other sketchy work going on. If there is, its probably a good indication of the type of maintenance he did on the rest of the truck haha The opposite is probably true too. If he did an awesome job, chances are the rest of the truck is pretty well cared for. I put a deposit down on the truck tonight an am gonna try to pick it up tomorrow night. Very excited to have my first-first gen cummins, looking forward to puttin a little money into it. Thats exciting! Post some pics once you get it! I was wondering what hand tools I'll need whenever I get my '91. Will I be needing metric stuff? anything special I'll need to pull the rear drums, etc? thanks! Anyone have any idea how much/ what kind of gear lube to use for the rear end of a 93 d350? 93 D350 5spd. Banks housing, intercooler, isspro tach, banks egt and boost. BHAF, 366 spring, 4inch exhaust. Air Bags and a gooseneck! hx40 and injectors coming soon! 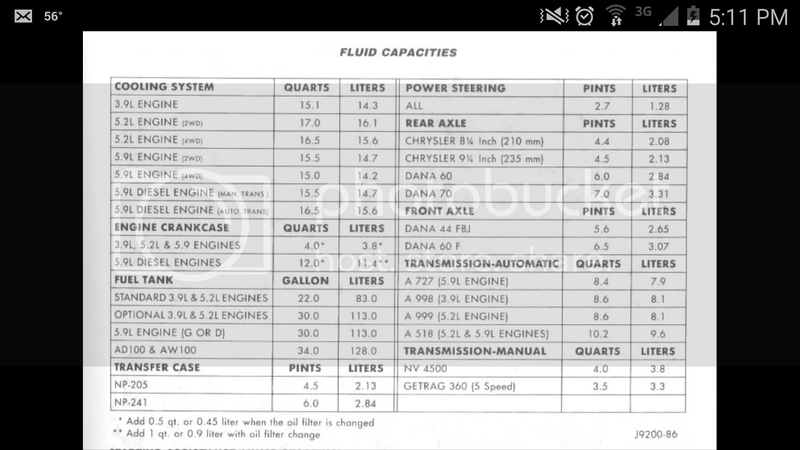 in terms of fluid weight, it depends on your climate and how much you plan on towing and working the diff. the more you work it and the hotter, the winner fluid weight you want. the opposite is true as well. sae why would you live somewhere like this? it also adds "a friction additive must be used in 8.25 and 9.25 limited slip differentials. Dana axles don't require any friction additive"
I got 80w 90. I don't drive it in the winter but I'm sure it'll be fine.